← Nothing To Envy; Ordinary Lives in North Korea. By Pepin van Roojin. Pepin Press, Agile Rabbit Editions, Amsterdam. 2008. 199 pages, ALL colour illustrations. A jewel of a book which duplicates all its content on a CD. 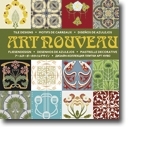 Chock full of wonderful tile designs from Northern Europe, Latin Europe and some of the Americas. This publisher has a large collection of books of interest to designers and artists on topics as diverse as how boxes are folded to many aspects of fashion design and into typography and several of these books on Tile designs. The only text is a one-page introduction to Art Nouveau repeated in 8 languages. This entry was posted in Uncategorized and tagged Art, Art Nouveau, Book reviews, Pepin Press, Tile Design, Tiles. Bookmark the permalink.